Get face-to-face with giant turtles, manta rays, and a dazzling array of fish. The Safari Explorer off the western coast of the island of Hawaii. Humuhumunukunukuapua’a is the name of Hawaii’s state fish. It’s an elegant little reef triggerfish, with yellow chevron pinstripes and a blue lip, but I think the Hawaiians selected it because its name is fun to say. I pointed and tried to shout it into my snorkel. If the word is tough to pronounce under normal conditions, it’s harder underwater. My wife, Kim, and I followed the fish in and out of cauliflower coral heads, through a cloud of striped surgeonfish and swaying schools of bright-yellow tangs. We passed a parrotfish, which crunched its coral breakfast so loudly we could hear it. The humu kept a dignified pace. We kicked along a coral cliff, which dropped into deeper blue, and out to a cluster of rocks where the surge broke into a blizzard of bubbles. When we lifted our heads into the air, we saw the black lava cliffs of western Lanai, the green slopes rising behind them, and the dark basalt columns known as the Five Sisters strung across the sea. It was mid-November, and we were on a weeklong voyage that took us to four of the Hawaiian Islands: Molokai, Lanai, Maui, and Hawaii, a.k.a. the Big Island. The tour was operated by UnCruise Adventures, which is an odd name for a 22-year-old company that runs cruises from Alaska to the Galápagos Islands, but the un comes from an effort to be different from other lines. UnCruise prides itself on flexibility. It doesn’t tie itself to scheduled port calls, so the itinerary can be guided by weather, wildlife, and whim. If the captain spots a pod of humpbacks, he can follow it; if he wants to explore an intriguing section of coast he’s never seen, he can do it. 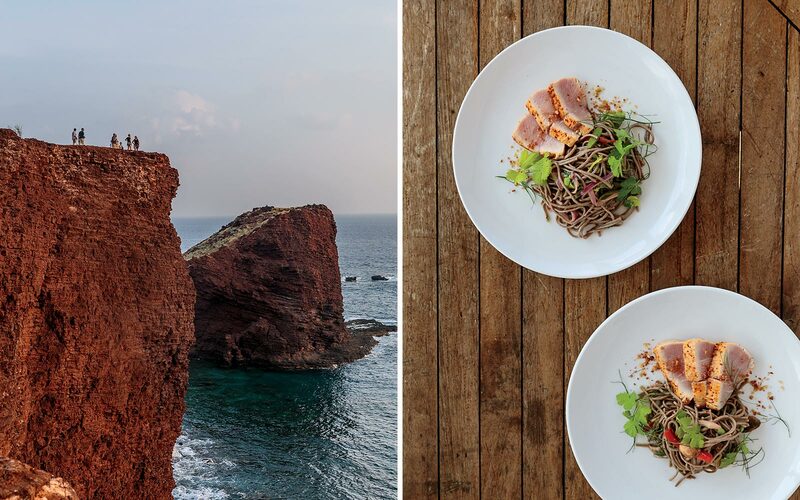 From left: A hike overlooking the Puu Pehe sea stack off Lanai; ahi tuna and soba salad aboard the Safari Explorer. UnCruise describes our ship, the Safari Explorer, as a “boutique yacht”; it carries only 36 passengers. It was designed for both comfort and adventure. It tows two 24-foot skiffs, which can bring snorkelers close to shore, and is outfitted with kayaks and paddleboards. The cabins are cozy and paneled in cherry, and each comes with a pair of waterproof binoculars. The food is superb, with most ingredients locally sourced. The trips are about engaging with the land and its wildlife. They’re also about meeting locals, which we did on our first night. At a hula performance on Molokai, the sparsely populated island where many believe the dance form was born centuries ago, we watched as 10 girls rotated in unison to the music, painting pictures with their hands. The littlest girl, who must have been seven years old, called out “No ka pua,” which means “because of the flower.” Then they shaped flowers with their fingers, reached for the sun, and brought their hands to their hearts. It gave me what locals call “chicken skin,” or goose bumps. The next morning, after breakfast on board, we took the skiffs into port and drove to a high point overlooking the spot where the Halawa Valley meets the ocean. The valley cuts into the eastern end of Molokai; it’s narrow and steep and covered in rain forest. A stream wound out of the trees into a protected cove flanked by sea cliffs. When we turned and traced the valley inland, we could see it end in a wall of mountains and the thread of a waterfall. Polynesians reputedly first landed in Hawaii at this river mouth—a fire pit in the valley dates from A.D. 600. At a shelter near the river, Anakala Pilipo Solatorio, a farmer in his seventies who is a direct descendant of those first settlers, blew the conch shell of welcome. Pilipo and his son Greg have embarked on a mission to keep the old ways and language alive. Pilipo pressed his forehead and nose to each visitor in the traditional greeting. He told us to inhale. In this way, he said, two people exchange ha, the breath of life. 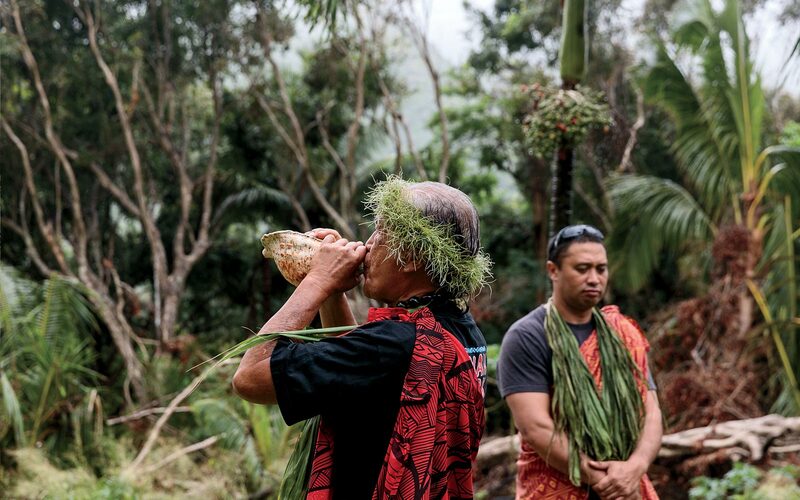 Anakala Pilipo Solatorio, a farmer of Hawaiian descent, blows a conch shell to welcome travelers. Half the group stayed at a shelter near the sea, and the rest of us hiked a couple of miles to the waterfall. We passed towering koa trees, which have been prized by canoe makers for centuries. White-rumped shamas sang in the canopy. The trail was littered with passion fruit and kukui nuts, which are so oily the early Polynesians burned them for light. Through the forest ran the stone walls of an ancient seven-terraced temple. Dai Mar Tamarack, our expedition leader, pointed out a smooth stone Molokaians consider sacred; for more than a thousand years women gave birth on it. This made me think about how Hawaii itself was born from the sea. A crack in the earth’s crust spewed magma in what geologists call a “hot spot,” creating islands. The movements of the tectonic plates carried the islands in a northwestward direction, and still do. This process is occuring 2,400 miles from the nearest landmass, and whatever has arrived here—plant, animal, or human—has made a great effort to do so. On the third day we reached Lanai, which is almost wholly owned by Oracle cofounder Larry Ellison. After our snorkeling adventure with the state fish, we walked around tiny Lanai City, which is set in a grove of Cook Island Pines and, at an altitude of 1,600 feet, is cool and breezy. We stopped at a shop that sold art made by local schoolchildren and bought a sea turtle made from shells. That evening in the ship’s library, Dave Simonak, a 63-year-old doctor from Texas, played James Taylor songs on an old guitar, as I talked about books with Lyn Bixby, a retired journalist and Pulitzer Prize winner who lives in northern Vermont. Lyn’s wife, Debbie Bixby, a nurse practitioner, was getting a complimentary massage on another part of the ship. Our fellow passengers were mostly couples and ranged in age from their twenties to their sixties. We made a game and adventurous group, dedicated to spending as much time outside as possible. The ship crossed the channel to Maui overnight, and we woke to precipitous green mountains and the low red roofs of the little port of Lahaina. We grabbed our snorkels again and skiffed into the Mala Wharf, which was demolished in 1992 by the devastating Hurricane Iniki. The long wharf tumbled into the bay in a tangle of beams and concrete slabs. Now encrusted with corals, it has become one of Hawaii’s most popular dive sites. Kim and I put on our masks and swam over it. I gasped: five adult sea turtles rested 15 feet down on a flat chunk of concrete. The largest must have weighed as much as a linebacker. One eyed Kim as she swam above, then glided to the surface beside her with three easy strokes of its long front flippers. Kim had to arch herself to keep from touching it. The turtle took a breath and sailed slowly back to its bed. A sea turtle near Mala Wharf, on Maui. I took a breath myself and dove down clumsily. Under the concrete slab, a five-foot-long whitetip reef shark idled and watched me. It seemed that the aloha spirit extended to the ocean, because we greeted each other and happily went our own ways. Dai Mar told us to take a couple of hours of shore leave, just when we needed it. Kim and I strolled hand in hand through the shops of Lahaina and bought—what else?—Hawaiian shirts and mother-of-pearl earrings. One of the unique things about UnCruise is its open-bridge policy. Passengers can wander up at any time and sit with the captain or the officers and learn about the route. If the officers need privacy, they shut the door. At daybreak on the fifth day I grabbed a mug of Kona coffee from the lounge and climbed to the bridge. The famous northeast trade winds had kicked up, and the ship was pounding through a quartering swell in the Alalakeiki Channel between Maui and the tiny, uninhabited island of Kahoolawe. Captain Winston Warr was at the wheel. We were heading southeast and could see the volcanic crater of Molokini ahead. The dark water of the channel was whipped to whitecaps. “Humpback at one o’clock,” the captain said. A half-mile off our starboard bow, a cloud of mist blew off the waves. Then another. The whale was running fast on the same heading. And then, out of the chop, it breached. A massive black missile leaped and crashed down, sending up an explosion of white. “That’s something that never gets old,” the captain said. The following morning we arrived on the western side of the Big Island. We anchored in the lee of the dormant volcanoes Mauna Kea and Mauna Loa, each of which rises more than 13,000 feet. The guides broke out the kayaks, and we paddled along lava cliffs and through a lava arch. We saw pale limpets clinging to the black rock. White tropic birds, with long, trailing tails, flew out of their nests on the cliffs. Debbie and Lyn are old hands at kayaking, and they paddled in perfect sync, looking like a winged creature. I tried to stand up and fell in. Back at the ship, we inhaled a lunch of loco moco, an unlikely stack of sticky rice, beef, and gravy topped with a fried egg. Afterward, Dai Mar dropped the gangplanks off the high decks and some of us tried 20-foot backflips. 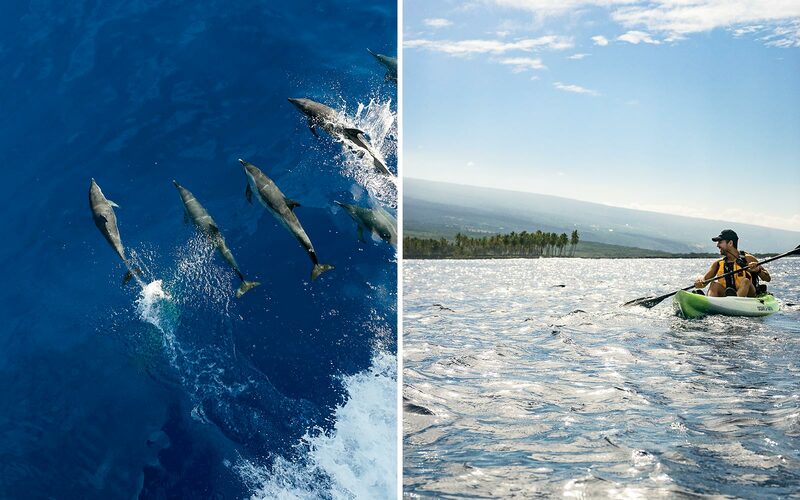 From left: A pod of spinner dolphins between Maui and Hawaii; kayaking off the coast of Kailua-Kona. On the evening of our last full day, as dusk fell off the town of Kailua-Kona, we tugged on wet suits and skiffed close to shore. Kim and I jumped into the inky water and swam to a surfboard that had a dive light shining from its bottom. Six of us clung to one board, and Mark, one of our chefs, flippered us toward the glow of submerged floodlights. These lights rested on the ocean floor, and scuba divers sat around them as if at so many campfires. Their plumes of bubbles rose in eerie columns. Schools of silver flagtails drifted in the beams that shone down from the surfboards. We could hear the clicks of a pair of huge bottlenose dolphins as they coasted through the murk. And then I saw why we were all there. The lights, both on the boards and on the seabed, attract plankton, which manta rays eat like popcorn. Something caught my eye, and I looked back at one of the flood lamps down in the rocks. I saw wings that were much longer than any bird’s, but moved just as fluidly. A flash of pale underneath. They reminded me of the undulating arms of the hula dancers, whose motions are sometimes inspired by the creatures of the ocean. The manta ray must have been 10 feet across. It sailed over the light and blotted it out, then vanished in a sea as black and inscrutable as sleep. A weeklong sailing with UnCruise allows travelers ample time to experience Hawaii’s natural environment by both land and sea. 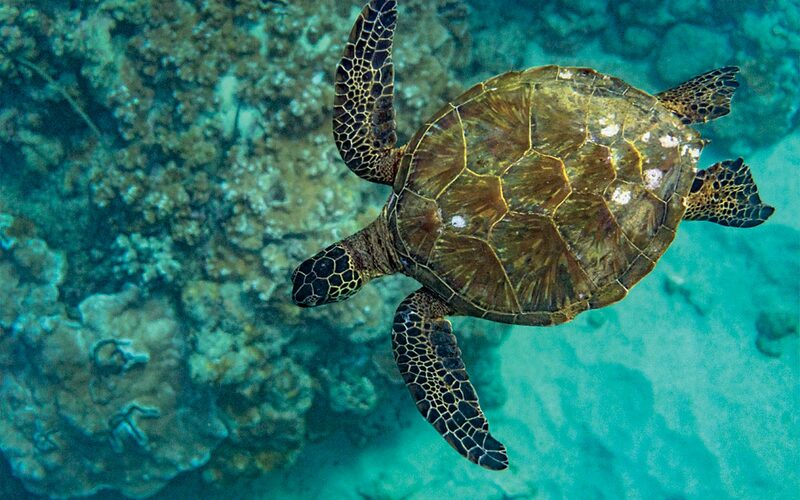 UnCruise Adventures offers its all-inclusive Hawaiian Seascapes itinerary every week between November 3 and April 6, 2019. The cruise is seven nights long and can be taken from Molokai to the island of Hawaii, or in reverse. From $3,995 per person. For cruises departing from Molokai, fly to Daniel K. Inouye International Airport in Honolulu, then continue via Hawaiian Airlines to Molokai Airport. For cruises departing from the island of Hawaii, fly to Kona International Airport. UnCruise provides transfers between the airport and your vessel if you notify it of your flight plans at least 60 days before sailing. The company also offers extended land stays in both Hawaii and Molokai. Casual, sun-protective clothing and hiking shoes are recommended for on-land excursions, and a brimmed hat and sunglasses are a must. Bring a swimsuit and water socks for snorkeling, a sweater or fleece for breezy evenings, and a light shell or rain jacket. UnCruise supplies masks, snorkels, fins, refillable water bottles, and sunscreen. UnCruise is the only small-ship cruise line to feature itineraries within the Hawaiian Islands. It also runs cruises to Costa Rica and Panama, the Galápagos Islands, Mexico’s Sea of Cortés, Alaska’s Inside Passage, coastal Washington State and British Columbia, and the Columbia and Snake rivers in Washington and Oregon.